YANGON – Myanmar’s national leader Aung San Suu Kyi, facing outrage over violence that has forced about 400,000 Rohingya Muslims to flee to Bangladesh, will not attend the upcoming United Nations General Assembly because of the crisis, her office said on Wednesday (Sept 13). The exodus of refugees, sparked by the security forces’fierce response to a series of Rohingya militant attacks, is the most pressing problem Suu Kyi has faced since becoming leader last year. Critics have called for her to be stripped of her Nobel peace prize for failing to do more to halt the strife which the United Nations rights agency said was a “textbook example of ethnic cleansing”. Aid agencies will have to step up operations “massively” in response to the refugee flow into Bangladesh, a senior UN official said, adding that the US$77 million (S$103.5 million) the United Nations had appealed for last week would not be enough. But a Bangladeshi border force officer said the number of people crossing into his area had fallen sharply, apparently because everyone had left districts most affected by the violence. Suu Kyi, in her first address to the UN General Assembly as leader in September last year, defended her government’s efforts to resolve the crisis over the treatment of the Muslim minority. This year, her office said she would not be attending because of the security threats posed by the insurgents and her efforts to restore stability. “She is trying to control the security situation, to have internal peace and stability, and to prevent the spread of communal conflict,” Zaw Htay, the spokesman for Suu Kyi’s office, told Reuters. International pressure has been growing on Buddhist-majority Myanmar to end the violence in the western state of Rakhine that began on Aug 25 when Rohingya militants attacked about 30 police posts and an army camp. The raids triggered a sweeping military counter-offensive against the insurgents, described by the government as terrorists. Refugees and rights groups say the security operation is aimed at pushing Rohingya out of Myanmar. They claim the attacks on Rohingya villages in the north of Rakhine State are caused by the security forces and ethnic Rakhine Buddhists, who have torched many Muslim villages. Authorities have denied that the security forces, or Buddhist civilians, have been setting the fires, and have blamed the insurgents. Nearly 30,000 Buddhist villagers have also been displaced, they say. The Trump administration has called for protection of civilians, and Bangladesh says all the refugees will have to go home and has called for safe zones in Myanmar. But China, which competes with the US for influence in Asia, said on Tuesday it backed Myanmar’s efforts to safeguard “development and stability”. The UN Security Council is to meet on Wednesday behind closed doors for the second time since the crisis erupted. British UN Ambassador Matthew Rycroft said he hoped there would be a public statement agreed by the council. However, rights groups denounced the council for not holding a public meeting. Diplomats have said China and Russia would likely object to such a move. Myanmar’s military, which ruled for almost 50 years until it began a transition to democracy in 2011, retains significant political powers and is in full control of security. Suu Kyi has no say over those matters. Nevertheless, critics say Suu Kyi could speak out against the violence and demand respect for the rule of law. Anti-Rohingya sentiment, however, is common in Myanmar, where Buddhist nationalism has surged since the end of military rule. 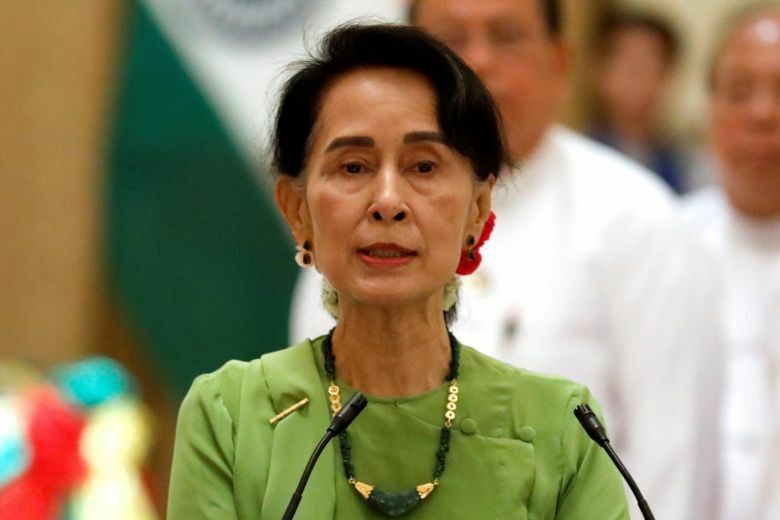 Suu Kyi, who the military blocked from becoming president and who says Myanmar is at the beginning of the road to democracy, could risk being denounced as unpatriotic if she were seen to be criticising a military operation that enjoys widespread support. A mob in central Myanmar threw stones at Muslim shops on Sunday but there have been no serious outbreaks of communal violence elsewhere. The government has warned of bomb attacks in cities and those concerns are likely to be compounded by an Al-Qaeda call to arms in support of the Rohingya. “The savage treatment meted out to our Muslim brothers ... shall not pass without punishment,” Al-Qaeda said in a statement, according to the SITE monitoring group. Bangladesh was already home to about 400,000 Rohingya who fled earlier conflict and many of the new refugees are hungry and sick, without shelter or clean water. “We will all have to ramp up our response massively, from food to shelter,” George William Okoth-Obbo, assistant high commissioner for operations at the UN refugee agency, told Reuters during a visit to the Kutupalong camp in Bangladesh. He declined to say how many people he thought might come but Bangladeshi officer Lieutenant Colonel Ariful Islam said numbers were falling off sharply in his area. “The people who arrived in the early days after the atrocities, now they’ve come out,” Islam told Reuters.